They do very good work. I'm very satisfied with their work. They were on time, they did what they said they would do, and the work they did met pretty much all my expectations. I would tell them that they're reliable, on time, polite, and they did a great job. There's a couple of things. First I like that they're a family-run business, and second is their expertise. I'd highly recommend them. There was someone here in the area that I used for years, but he retired. So when I needed some help after that, I looked around, randomly picked them, and I've been very happy ever since. They're always here on time. Everything was very good and very matter of fact. What they said they were going to do, they did. 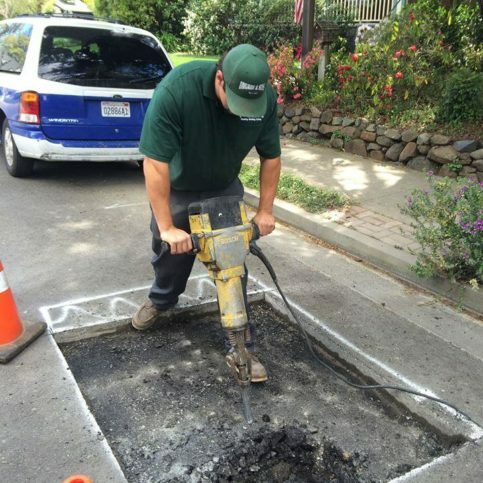 Ongaro & Sons provides a complete range of plumbing services for residential and commercial clients in Sonoma and Marin Counties. 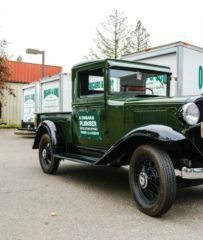 In addition to servicing, repairing and replacing all types of plumbing systems, the familyowned and operated company has the in-house capabilities to install and repair water heaters and HVAC systems, clean and replace sewer lines, install products that improve indoor air quality, and more. 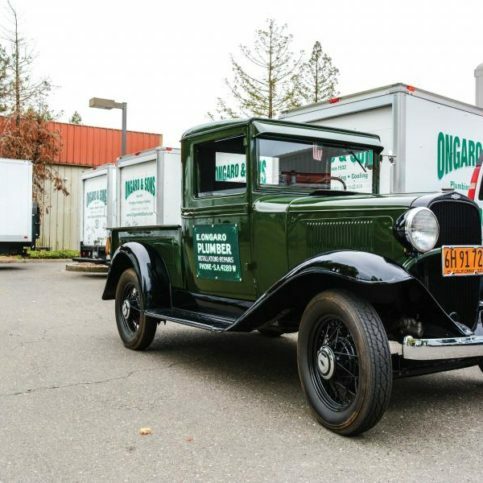 This truck is a replica of Ongaro & Sons’ first service vehicle. 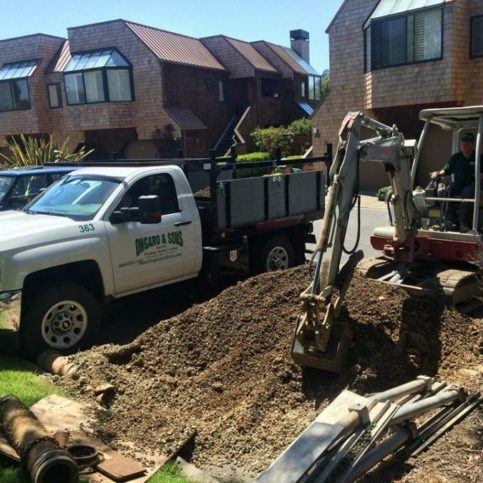 Ongaro & Sons provides a wide range of plumbing services for residential and commercial clients in Sonoma and Marin Counties. 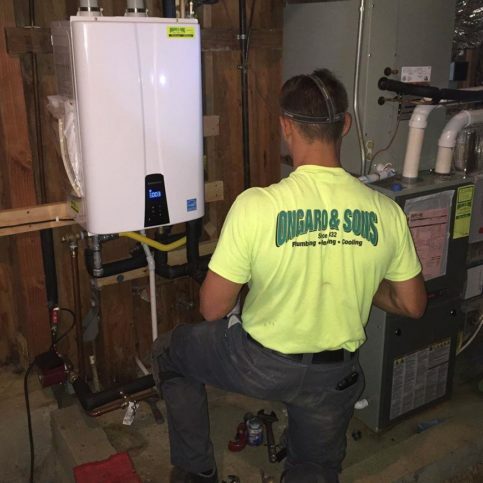 The family-owned and operated company has the training and equipment to service, repair, and replace all types of plumbing systems, and it’s also qualified to install and fix water heaters and HVAC systems, install products that improve indoor air quality, and more. 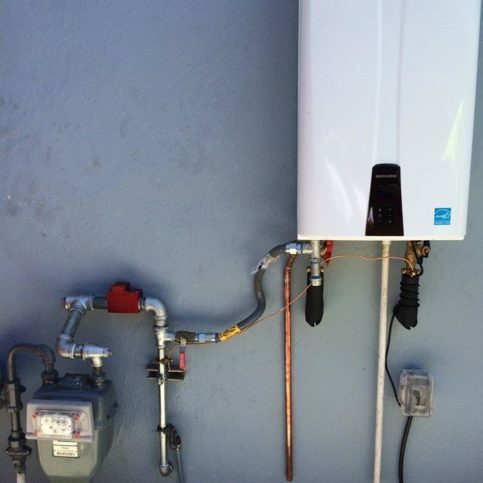 Cutting-edge plumbing and HVAC technologies are helping homeowners save substantial amounts of water, energy, and money. Q: My toilet randomly turns on and off throughout the day. What’s going on? Q: My water bill seems unreasonably high. Can you troubleshoot the problem? Ernie Ongaro is a 37-year veteran of the plumbing and HVAC industries and president of Ongaro & Sons, a Diamond Certified company. He can be reached at (707) 652-9891 or by email. Outside of work, Ernie engages in a variety of active pastimes, from traveling to restoring vintage cars. “My wife and I love to travel, both within the United States and abroad,” he says. “I also enjoy restoring vintage vehicles. I have a 1942 Willys Jeep that I drive in local parades, and I also restored a 1932 Chevy pickup that I modeled after my grandfather’s first plumbing truck.” Additionally, Ernie enjoys reading and spending time with his family, including his grown children, Ernest and Allison. A: I’m a history buff, so I love to read biographies and historical accounts. A: Vintage cars, trucks and military vehicles. A: Definitely an early bird. SANTA ROSA — Here in California, there’s great concern about conserving resources like water, gas and electricity. If you share this concern, you may be wondering how you can reduce resource consumption in your home. Fortunately, there are many ways to do this, even if you’re on a limited budget. In fact, you may be able to get government assistance with financing water and energy efficiency upgrades. For example, Energy Upgrade California’s Home Upgrade program offers rebates and incentives for a wide range of home improvements, from duct sealing and adding attic insulation to installing high-efficiency HVAC and water heating systems. This is just one of the many programs aimed at motivating California residents to take part in the statewide resource conservation effort. Even if you’re not interested in upgrading your HVAC and plumbing systems, there are things you can do on a smaller scale to reduce your home’s resource consumption. For example, having your HVAC system serviced and regularly changing its filter can go a long way toward helping it perform more efficiently. You can also reduce your home’s water consumption by adding water-saving faucet aerators and showerheads in your bathrooms and kitchen. Most local municipalities provide water-saving aerators free of charge—all you have to do is screw them onto your faucets. If you want to know more about which specific areas of your home would benefit from water and energy efficiency upgrades, talk to a local plumbing and HVAC professional. SANTA ROSA — Host, Sarah Rutan: When it comes to reducing consumption of natural resources like water and energy, there are measures that even the most budget-constrained homeowners can implement. Today we’re in Santa Rosa with Diamond Certified Expert Contributor Ernie Ongaro of Ongaro & Sons to learn more. Diamond Certified Expert Contributor, Ernie Ongaro: Here in California, by the day, we’re getting more and more concerned about using up all of our resources. Check your local municipality, and there might be some great rebates that you could utilize. 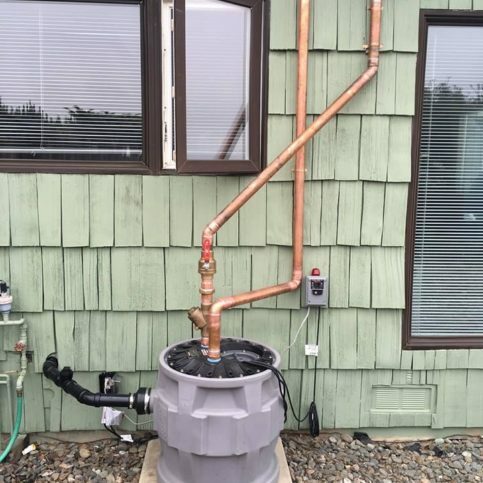 For instance, if you upgrade to a high-efficiency furnace or water heater – or even my local municipality of Santa Rosa will give out free little aerators that you can screw into the end of your faucet, and it will reduce the amount of water that you use. Ongaro & Sons : Average 9.2 out of 10 based on 178 unique customer surveys of customer satisfaction. We are comfortable with them. They were prompt, efficient, friendly, knowledgeable and a pleasure to deal with. The price was excellent. Marvelous deal for a furnace tune up that they were offering. I was out of hot water and they squeezed me in on a full day and that was a really big deal to me. I was very impressed. I did recommend them. The young man that came out was very friendly, helpful and generous with time and did a really good job. They responded quickly and it was kind of an emergency so that was nice. Other companies wouldn't come. And the young man was so nice, I wish I could remember his name. They are reliable. When they say they are going to be there, they are there. They went above and beyond with our heater. I've had all three of them out, they are all so nice and professional. Very reliable, they put something in that I didn't like and had no problems changing it. They put in an air conditioner and didn't work for the second floor and they fixed it with no problems and no extra charge. They were professional and did a good job with the two times I had them here. Thorough and friendly and they make things clear to me which is not always easy. Very consistent, I have been using them for the past 15 years. They are the top of the line as far as their service and they keep their appointments. They are all good mechanics. The boys have set up quite a business and I have been working with them since 1979. I was just a small contractor and I worked with basically two plumbers over the years and they have been doing all the work since. I've known them a long time. They are a good, honest company and they know what they are doing. I recommend them. They are good about explaining things and I ask a lot of questions. They are very honest and dependable. I like that they do explain everything. They are very professional, very nice and clean. They provide a lot of services so there are a lot of things they can help you with from plumbing to HVAC. Very happy with their work, they are very conscientious and did an excellent job. The availability of the manager, he was always available and got answers when I needed them.